Our 7th graders participate in our special program model – Mesorah-Choosing Your Commitment: Embracing and Reinterpreting a Living Tradition. In Pirkei Avot 1:2 we find inspiration to reframe and focus our learning. “…Upon three things the world stands: on Torah, on Avodah (prayer) and on Gemilut Chasadim (kindness to others).” Using the lens of these three entryways, students will be offered a broad range of experiences to better prepare for both B’nai Mitzvah and for living a Jewish life. Over the course of the year, each student selects courses from the overarching themes. Courses are designed to be engaging, to be interesting and to encourage exploration of Jewish values in new and creative ways. In addition to elective and workshop choices (these options meet on both Wednesday evenings and an additional day our students choose. 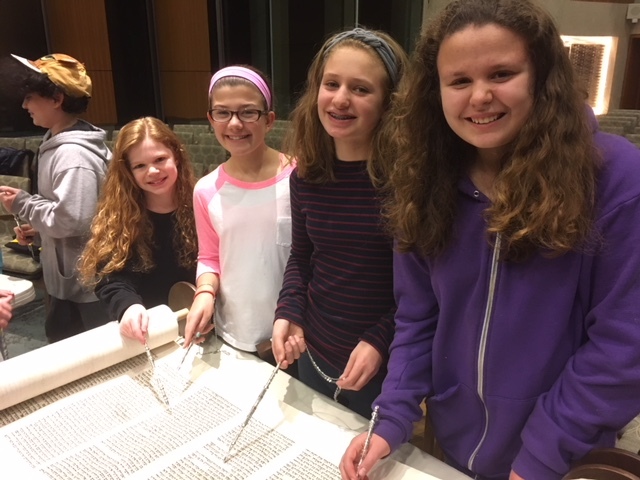 Additionally, our 7th graders spend Wednesday evenings together learning about the Jewish lifecycle from birth to death. Hebrew learning takes place every Wednesday evening through Tefila and practice preparing for Bar/Bat Mitzvah with Cantor David. Students will attend small group student sessions where they have the opportunity to bond with Cantor David and will practice and lead Tefillah. Cantor David leads 3 parent-only sessions during evening Religious School, from 7:45-8:30pm. Student and parents meet with Cantor David 7 months prior to their date and receive tutoring information and materials as well as schedule future sessions with Cantor, Rabbi and tutor. A specific timeline is established based upon your exact date. For more detailed information, see our B’nai Mitzvah Manual.